Keeping all outside areas clean and properly maintained is becoming increasingly recognized as an important element of successful business property management. Gauging customer loss due to having unkempt grounds is harder than to do a similar assessment for a business' interior, however. The number of people who choose not to patronize a particular business establishment or mall because they 'don't like the looks' is almost a complete unknown, since that is a choice made by many before they ever park and come inside. In today's highly competitive market, business property managers can't afford the tarnished image caused by cutting back on exterior grounds maintenance, and regular sweeping is arguably the most important component contributing to overall looks. 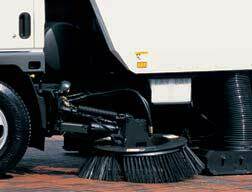 And, when you choose who to have on your property doing your parking area cleanup – usually at night when you're not there – there are many reasons why Custom Sweeping Service is your top choice. Outside parking areas are where business owners hope their potential customers will derive an initially good 'first impression.' The way the outside area looks also projects an image of how the rest of the concern will be operated. If exterior maintenance is slipshod, then potential customers might well expect the internal cleanliness and other affairs of the mall or business to also be poorly run. Shopping centers are finding maintenance of market share to be an increasingly competitive proposition. It's virtually impossible to develop or retain the desired competitive edge if the grounds on the exterior of the business are unkempt. When a parking area is clean to begin with, shoppers are more careful throwing trash out of their cars when they come to shop. Keeping litter picked up reduces the chances of slip-and-fall injuries, as well as the business property's potential liability in any resultant lawsuits.